Brand-new SRT Vipers race each other down the drag strip at the Texas Invitational. 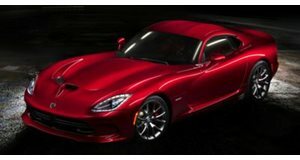 It’s been a year since the 2014 SRT Viper broke cover at the New York Auto Show, but this could well be the first time we’ve seen the car in action on the strip. Last weekend, at the 2013 Spring Texas Invitational roll race, two of the new American supercars turned up to make a run together. The cars both look fantastic in red or blue with white stripes, and the sound of the 640-horsepower 8.4-liter V10 is like music to our ears. But how do they fare down the drag strip? As you’ll discover in the video, courtesy of 1320video, the blue Viper is the fifth to roll off the production line, and with only 11 miles on the clock it’s understandable why the new owner is reluctant to engage the launch control. Two new Vipers drag-racing the quarter-mile still makes for impressive viewing.